The Kenmore brand is probably most well known for its large home appliances, such as dishwashers, refrigerators, washers, dryers and stoves, but it also manufactures smaller appliances, such as sewing machines and vacuums. The Kenmore Progressive upright vacuum cleaner offers a HEPA filter, infrared dirt sensor and a manual height adjustment. If the belt on the vacuum happens to break, split or crack, it will need to be replaced. 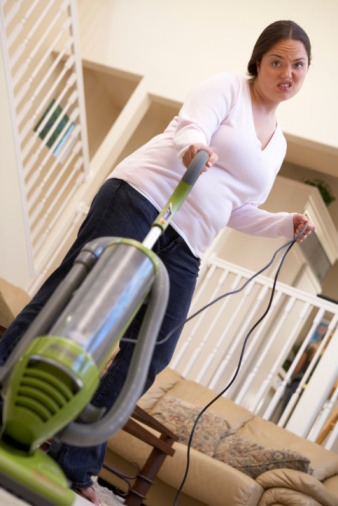 Doing so only takes a few steps but should only be done when the vacuum is turned off and unplugged from the electrical supply. Turn the vacuum over and remove the four nozzle cover screws with a flat-head screwdriver. Turn the vacuum back over and press down on the release pedal to lower the handle into a horizontal position. Lift up the rear latches and then the side latches to remove the cover, pulling from the back to remove the cover. Remove the agitator assembly and use a pair of scissors to remove any excess string or fiber from the brush roller. Remove the old belt from the belt path on the right side of the agitator brush assembly, noting how the belt is looped around the agitator. Slide the new belt over the motor drive, near the back of the vacuum head, and then over the belt path until it forms a loop. Place the agitator assembly into the end cap. Ensure the board is upright and any wires are tucked into place. Line up the front of the cover and the base and rotate the cover back to line up the latches. Press it firmly until the latches snap into position. Turn the nozzle back over and replace the four cover screws.